We initially launched with the idea of enabling customers with their own high-quality cloth to work easily and frictionlessly with a superb Sicilian tailor. Then last fall we introduced the Essential Bespoke line aimed at first-time bespoke customers. Similar to traditional bespoke, Essential Bespoke includes cloth. The great benefit of this new line is radically simplifying your decision process to just one item - blue or gray. We take care of everything else. Now we'd like to give our original idea of working with customer-supplied cloth the clarity of its own name - Simply Bespoke. We've added a name but the idea remains the same. 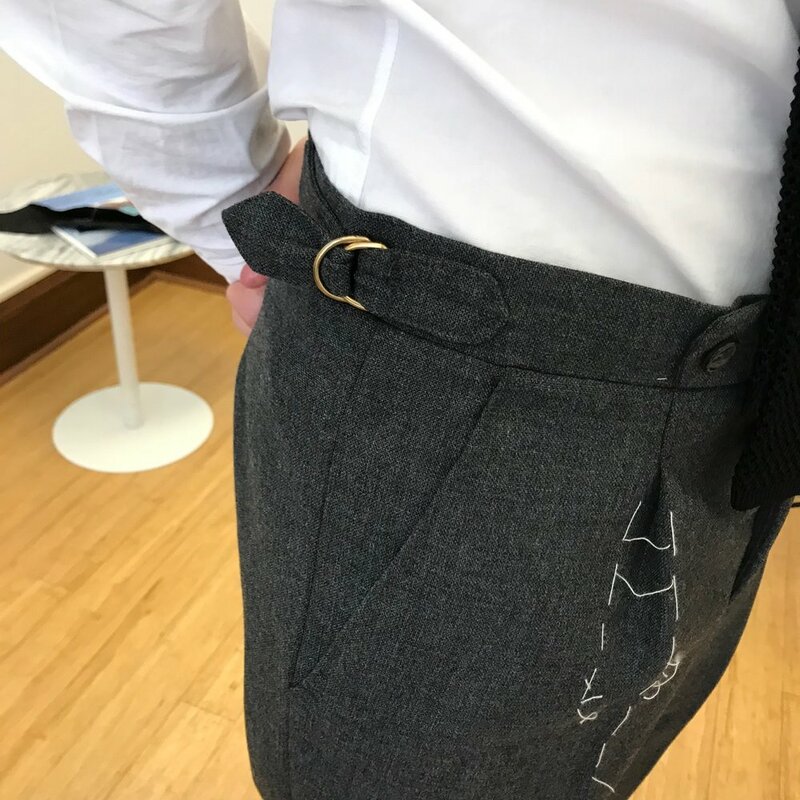 With Simply Bespoke, you enjoy sourcing and selecting your own cloth as well as owning the process of managing how much cloth you need for your commissions. This more hands-on approach is not for everyone but can be a very satisfying experience for quite a few! Since we are attracting interest from first-time bespoke customers, we have greatly expanded our in-house selection of cloth. This enables you to view physical swatch books similar to a traditional bespoke tailor or online swatches in some cases. This is ideal for those who don't have easy direct-to-consumer access to cloth and removes the need to send your cloth to me. We can now source a variety of English and Italian cloth such as Ariston, Cerruti, Dormeuil, Drapers, Dugdale, Escorial, Hardy Minnis, Harrisons, Holland & Sherry, Scabal, Lesser, Porter & Harding, Vitale Barberis Canonico, and W. Bill. If we source the cloth for you, prices start at $2,250 for a jacket (i.e. our Essential Bespoke line). For those supplying their own cloth, please keep in mind our guidelines on cloth length. Flexibility is a wonderful advantage and benefit, especially in matters bespoke. But it does create greater complexity and this is one of our key challenges as a tailoring brand offering even more flexibility than is usually found among bespoke shops. Below is a calendar-based guide to help navigate how and when to place an order with Sicilian Reserve. It lays out the different options and timetable for new and returning customers. For those supplying their own cloth, please check out our guidelines on cloth length and sourcing your own cloth. For new customers, please consult our guidelines for initial consultations. If you are new to fittings, we also recommend reviewing our description of the fitting process and our fall 2017 fittings. Still have questions? Feel free to reach out to us at contact@sicilianreserve.com. Very excited to see our first set of orders getting closer to shipping. This one is a wonderful spring/summer gunclub sports jacket in Holland & Sherry cloth. Ours is both a true bespoke process and product. Sicilian Reserve jackets are made to the workshop’s highest standard: individualized paper pattern, creation of a basted jacket, hand-padded canvas in chest, lapel and collar, hand-attached linings and pick-stitching. In addition, a fitting is included to make any fit adjustments to the basted jacket. In preparation for your fitting appointment, the workshop creates a partially constructed or basted jacket that you try on as a basis for refining the fit of your jacket. The body of the jacket is exposed with the internal canvas of the chest, lapel and collar. The sleeves and shoulders are attached with basted stitching which means they can be removed and adjusted as the tailor refines the fit of the jacket. Before the tailor travels to the fittings, the workshop creates a “fitting pack” for each client containing the basted jacket (and/or pants) and order form to document changes in the fitting process. Then we set up the room we are meeting in and get ready for your arrival. When we meet with you, the tailor and I will examine the shoulder, chest, waist and overall proportions of the jacket. The tailor will shorten, lengthen, let out or take in different parts of the jacket, all the while pinning and marking these changes on the basted jacket in real time. These fit adjustments are also subsequently reflected in your paper pattern back in the workshop. The pants are a bit more straightforward. We take a look at the overall line and then examine the fit at key spots such as the waist, seat, thigh, leg and length. During the fitting you will finalize your preferences for jacket length, sleeve length, shoulder line (padded v. nonpadded), shoulder extension, button point, jacket waist and trouser length. We typically have a discussion of these features at the time of the measurements and order taking but the fitting will enable you to make a final determination. It is essential that you are comfortable with your choices and that you fully approve the changes made at the fitting. These choices are often not reversible (e.g. button stance/height). One of the great strengths of Sicilian tailoring is its flexibility. Although our base jacket has minimal canvas and no padding, our tailor can flex up or down the amount of structure in your shoulder. Although we don’t lock you into a particular shoulder structure, we do make recommendations if you have extremely sloping or over-square shoulders. Last but not least, we will discuss lining and button choices that would go well with your commission. We offer bemberg linings and horn, corozo and mother of pearl buttons. The tailor and I will make recommendations on linings and buttons but you are certainly free to make your own choices (or even bring your own linings and buttons). Below is just a sample of cloth selections made by our clients. They reflect thoughtful and informed consideration of the function of the jacket and the desirable characteristics of the fabric. Escorial navy hopsack. Wonderfully soft hand and finishing using high quality yarns, scoring very high for skin comfort and breathability (sourced from Pepper Lee). Hardy Minnis 3-ply grey fresco. The upper echelon in weave construction for durability and practicality (i.e. wrinkle resistance and recovery). Holland & Sherry wool-silk-linen blend in blue-brown check. A wonderful balance between design and comfort due to fiber blend and weight. Hardy Minnis 2-ply fresco in blue. Informal suiting with open, durable weave great for traveling and work/post-work settings. H. Lesser summer kid mohair and wool blend in blue/grey stripe. Highest quality, vintage, pre-acquisition Lesser balancing wearability and comfort. Preparing your commission - how flexible is our tailor? For those who are new to Sicilian tailors or bespoke tailoring, you may be wondering how flexible our tailor is and the kinds of features you can specify for your bespoke commission. That's a great question. The tailor we’re working with can make clothes for a variety of body types and can accommodate a wide range of style choices. His clients run the gamut from children to adults. He has dressed men and women from across a variety of professions from business and academia to opera and the arts. In terms of shape and silhouette, he has done quite a bit of stage/theatrical costume work so if you want retro, eccentric and unusual he can do so without batting an eye. Even more so if you want classic and conservative style. You might have experienced or read that many tailors have a preferred house style that they are reluctant to deviate from. A house style might typically have a fixed jacket length for a specific height, open or closed fronts, a specific amount of waist suppression, a high or low button stance, a high or low gorge height and a specific lapel width. If you’re unsure, our tailor will certainly make suggestions for your commission. But you are not constrained by them, especially if you have a clear idea of your commission or are experienced with bespoke. When I was looking for the right tailor to work with, flexibility was one of my top criteria and it's a key reason why I chose this tailor. I came to this conclusion after spending hours talking to him and his coworkers in his workshop and viewing multiple examples of his finished work and those in progress. Based on what I saw, the tailor is fully capable of executing your choices technically and attitudinally. For example, I went with a shorter length on the sample jacket than I normally wear even though the tailor suggested a slightly longer one. I also wanted fairly open jacket fronts. For the sample pants, I let him make his default style which tends to be slim and lower rise. In addition, I had the opportunity to meet and chat with a local client during one of his fittings. This particular client had very specific and unconventional requirements for his evening velvet jacket. Moreover, he was challenging to fit properly because of his forward abdomen and swayback. But based on what I heard from the client, the tailor accommodated both client preferences and fit without any issues technically and attitudinally. In sum, you will have flexibility, if you choose to exercise it, in a number of areas. We require the following minimum cloth lengths based on your height and chest size up to US mens size 42. Of course, it's always better to provide more cloth than the minimum. Minimum cloth lengths require a standard 59-62 inch (150 - 157 cm) cloth width. Please check your cloth width and length before ordering. Lengths below can accommodate single or double breasted jackets with full lining. If you are between 5'7" and 5'11", round up your height to 5'11". Note: Yard lengths are generally rounded up from their metric equivalents for convenience and safety margin. For garments, heights, cloth widths or chest sizes not listed here, please consult with us first before purchasing your cloth. Sports jacket = 1.75 yards (1.6 meters) for plain cloth or 2.0 yards (1.8 meters) for patterned cloth. Note: Half or quarter lined jackets require a minimum of 2.5 yards (2.3 meters). 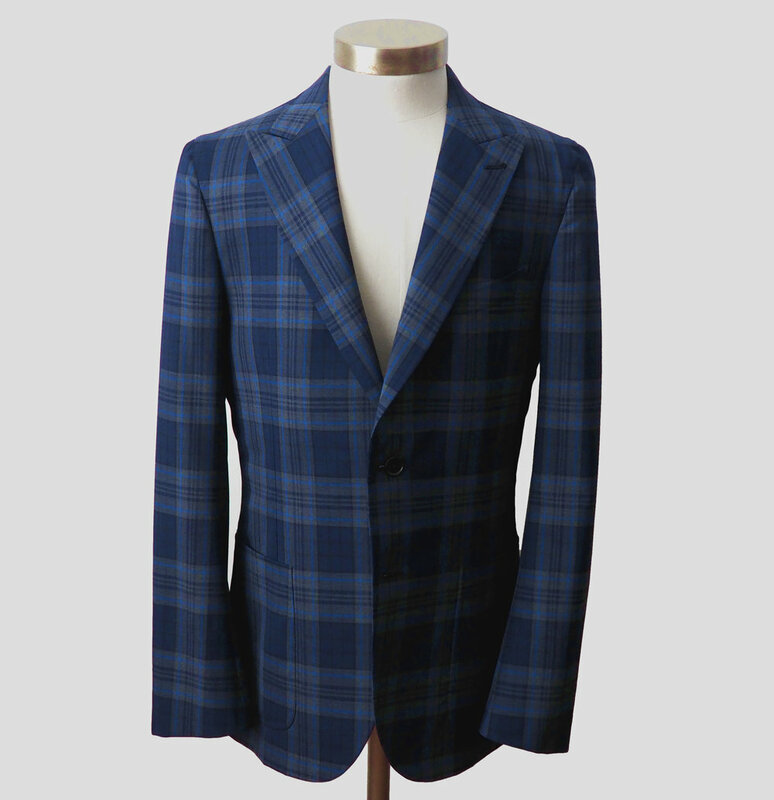 Sports jacket = 2.0 yards (1.7 meters) for plain cloth or 2.25 yards (2.0 meters) for patterned cloth. Note: Half or quarter lined jackets require a minimum of 2.5 yards (2.3 meters). Our lengths are usually less than the generic numbers cited on the web or by other cloth merchants or tailors (e.g. 2.5m for a jacket or 3.5m for a suit). Generic cloth lengths are intended to cover nearly all possible body types and therefore include excess margin not needed by our tailor (or most Sicilian tailors for that matter). 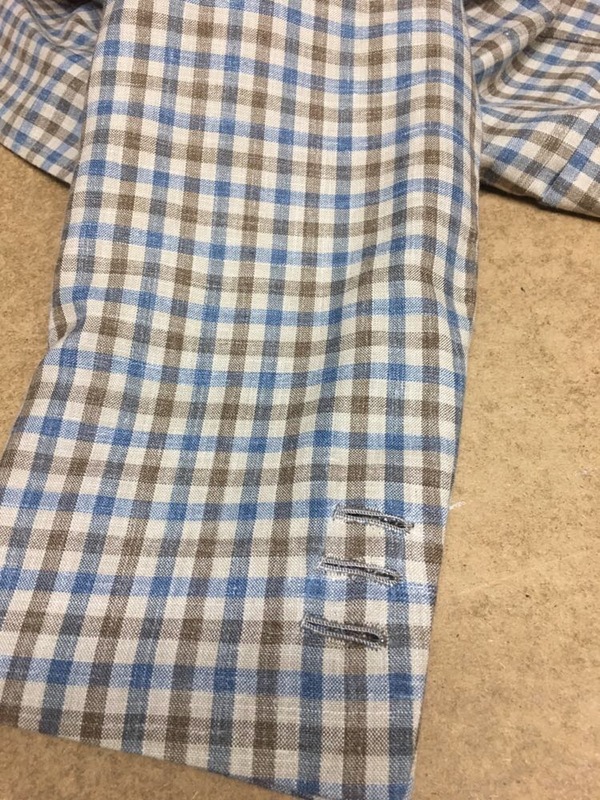 We will provide lining for your commission and will tend to match lining color with the base or dominant color of your cloth but you will have a range of color options for lining and buttons.